Reliable and secure way to manage corporate crisis anytime anywhere. 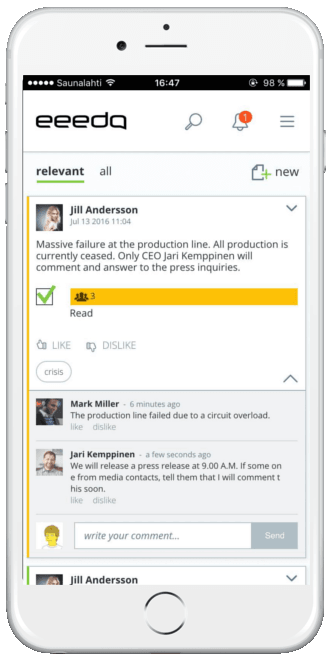 Manage internal & external crisis communication and tasks on a single dashboard. Powerful and safe way to manage corporate crisis anytime anywhere and using any device. Only the relevant information for the user is displayed to secure an efficient solution for the crisis. Manage internal and external communication, situation report deliveries and task management for the crisis team. After the crisis situation, analyze the process using the same easy-to-use tool. 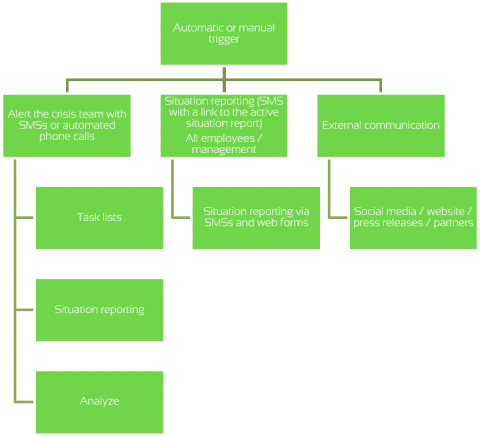 The crisis management & crisis communication software is fully customizable to your match processes. The crisis situation can be started automatically, for example, from a fire alarm. eeedo activates the crisis team using automated phone calls, 2-way SMS, mobile apps, email and the web service notifications. Our server infrastructure is ISO 27018 certificated and all data transfers are protected with secure 256-bit TLS/SSL encryption. Would you like to be prepared? Fill in the details and we’ll help you to ensure business continuity during a crisis! In exceptional and crisis situations, eeedo manages fast and secure two-way communication. The delivery of messages is ensured to the right individuals by mobile push notifications, two-way SMSs, automatic phone calls and email. Preparing and practicing for crises is necessary if you wish to be prepared for the worst. 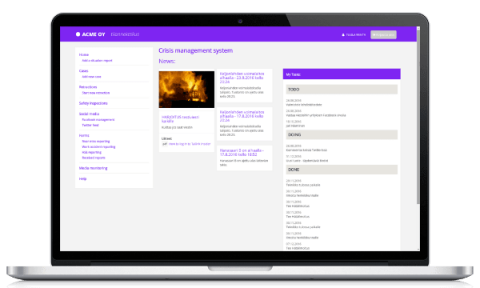 Our system allow you to practice and test your crisis management capabilities. eeedo’s crisis management dashboard provides you a clear understanding how the situation is developing. For example, what is done, what still needs to be done, who has done it and when. The pre-set crisis management groups allow you to start managing the crisis without delays. Managing your online reputation is mandatory. Our Facebook and Twitter integrations allow you to manage your Facebook page’s comments and reviews as well as monitor Twitter discussions on a single dashboard. Pre-set and dynamical crisis groups and roles scale to the size and effect of the situation. Pre-set and dynamical task list based on the current situation. Up-to-date situation report delivery and status updates. Two-way communication connecting several communication channels. Bi-Directional integrations. For example, triggers from building automation, alarm and fire alarm systems. Role, area and location based delivery of instructions. Automated storing and logging of information for later analysis and reporting. Would like to hear more? Fill in the details and we’ll tell you how you can be prepared. Would you be interested to hear how our customers have managed real life and simulated crises?